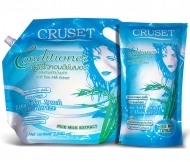 Cruset Shampoo With Rice Milk Extract 1,000/2,700 ml. A481000C100UT Shampoo With Rice Milk Extract 1,000 ml. A482700C100UT Shampoo With Rice Milk Extract 2,700 ml.